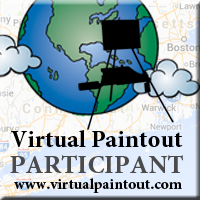 It’s Paint Party Friday again! If you aren’t participating, you should be. It’s a great motivator to actually get something painted during the week and it’s fun to surf around and see what everyone has been working on. It doesn’t have to be a big painting and it doesn’t even have to be finished. This week, I have a little watercolor sketch in my sketch journal. I can find time to work in my little sketchbook even when I can’t focus on starting a new canvas or a real watercolor. This is the front porch of the General Store in the nearby town of Covington, LA. I love the look of that old red and white gas pump with the blue shutters. And how many businesses have a front porch with a swing? This entry was posted in Arts & Crafts and tagged challenges, sketches on April 22, 2011 by admin. this is very well done. it gives me the feeling of a warm summer afternoon, just sitting at the general store on the porch swing! LOVE that. i like the colors, too. and the reflections in the windows! great one! Very nice work. HAPPY PPF! oh the details in this are gorgeous!!! wonderful painting!!! Happy Good Friday and Happy PPF!!!! i forgot to leave my name, but the first comment is from me, heather – sorry. you’re so talented…love dropping by to see what you’ve done. This is beautiful. Awesome detail. Happy Easter! This is great and would be a wonderful full sized painting! How quaint the little town must be. I agree that PPF is a great way to stay motivated! It’s “making” me create and I love it! Happy PPF! The details are wonderful. I think all businesses should have a front porch and a swing so we can take a load off! I would love to be sitting on that swing looking at the trees reflected in the window. Great work. I love it! Thanks for sharing. Happy Easter, PPF, and a Good Friday to you too. Wow, such attention to detail! Beautiful work! This just feels like a summer afternoon visiting a general store. I LOVE it! It makes me want to take a deep breath and relax in that swing. Excellent work! Your sketch is beautiful! Well done! I love this painting, it has a very homey feel to it. A scene from the past when things were so much more relaxing. This is such a beautiful painting. I would like to sit in that swing and have a cup of coffee. Wishing for warmer summer months when looking at this painting. Luv the reflection on the window and the old barber post is a little nostalgic note in your picture story. Either way a little blast from the past! Lovely and quaint. I bet the folks that work there know their customers by name and are friendly and cheerful whenever anyone pops in. Nice job! Looks like you’ve captured the warmth and lovely colors of this unique porch! Thanks for visiting my eggs. Love this piece. But I love old stuff like that anyways you did a great job capturing the mood and the setting. Loved seeing your work. Happy PPF! 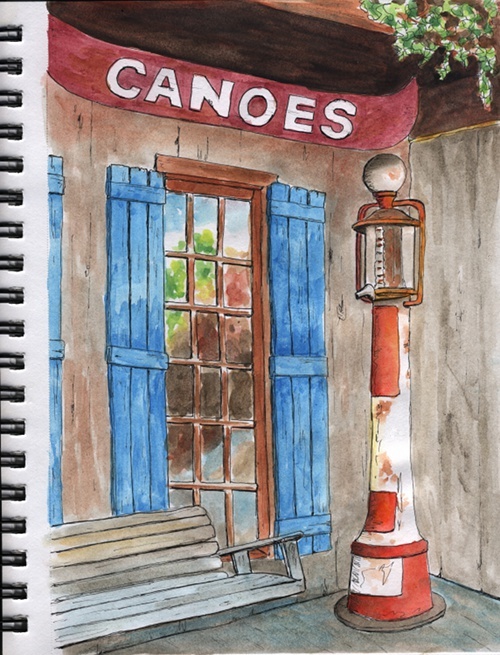 I am always amazed at what artists create in their sketchbooks….this is a great watercolor! Love the contrasting blue shutters with the red pump…very lovely! You make me want to try to paint something besides faces. I love the reflection in the glass.